Got goldfish? Post a pic! How many of you have goldies? Please share your pictures and setups! 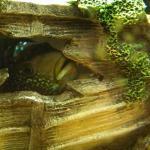 They live outside (undercover) in a 40g tank. Btw your mamma of two is a beauty!! Anyone else? I know there are more of you hiding out there! Dexter is the Oranda. Below he is in an Epsom salt bath working on his SBD. Hisenberg was an ICH covered baby Calico Oranda I got from an lfs and Tubby was my sons pick from Petsmart. They are in a 44 tall. Hey Mumma, what is that pinkish looking one? It's beautiful! I like their names! Hisenberg's a cutie!! I haven't named mine yet. I don't know what kind he is exactly. He's either a fantail or vailtail cross something or other. (one of my beautiful mutts!) He's bright white and has orange lipstick and an orange patch on his belly. It is pretty cool. Having an ant problem though lol! It's summer here at the moment. I'll have to get them a heater (or two) for winter. It can reach freezing point some mornings. The black fish is called a moor.